I-Lawns Wadala, Mumbai Wedding - Bright, Bold & Extravagant! A stunning bridal lehenga in pink designed by the Guru of bridal wear, Sabyasachi along with pankh styled enamelled jewellery paired with stunning polki diamonds from Diva Creations and Sunil Jewellers – Tanvi made aaaaall the right choices for her Indian bridal ensemble. To top this she wore gorgeous golden Jimmy Choo heels making for a perfect Indian bridal ensemble! Dolled up by Farzana Jussawalla who gave her a look that had bold eyes and pink-flirty lips. 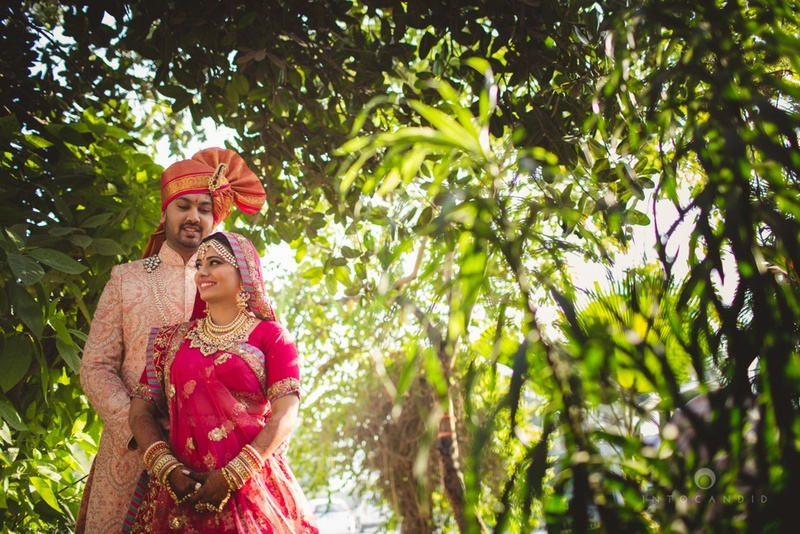 Balancing out the traditional indian bride aspect with Tanvi’s young, fresh personality perfectly. To complement her stunning sabyasachi lehenga, Gaurav donned a fully-embroidered sherwani in tones of bronze and peach from Vig Sons. One aspect of this wedding that had yes yelling ”YESS!” was the groom and bride’s entry. We’ve all seen the traditional Dhula on a Ghodi and Dhulan on a palki, but Tanvi and Gaurav decided to do their entry the cool couple way! The groom entered on a Segway! And not just any Segway, it was a Segway fully wrapped with white jasmine flowers for that Indian wedding feel! Wearing his peach toned sherwani and classy reflectors, Gaurav made the most dapper groom entry we’ve seen! Tanvi’s bridal entry was equally beautiful as she made her way to the mandap in a fully covered phoolon ki chaadar. This chaadar was not just covered from the top but all of the fresh flowers dangled right down to the floor and swayed beautifully as Tanvi walked in it. What we especially loved about his pretty bridal entry was the fact that all of Tanvi’s sister’s brought her to the wedding mandap – a sight rarely seen. So much #GirlPower, we love it! Their entire wedding ceremony was set in a theme of yellow and white – an ideal colour combination for an outdoor day-time wedding like Tanvi and Gaurav’s! They opted for a no-structure mandap but only had tasteful floral pastings in the figure of om. That, along with dangling floral chandeliers and beautifully stretched out wedding drapes was all that was needed to make their wedding a beautiful affair.